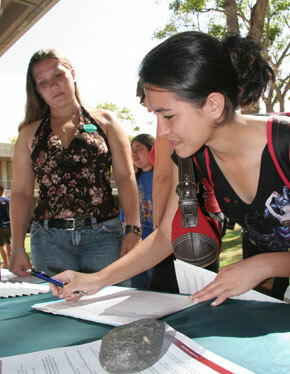 Samantha Cassidy Tivayan left her name with Julia Dela Sierra at the UH-West Oahu booth Thursday during the Leeward Community College Career Fair. For some students, shopping for college -- like buying real estate -- is all about location, location, location. And lower prices help, too. Those are some of the selling points as the University of Hawaii at West Oahu recruits its first freshman class. The school has leased classroom space at the Island Pacific Academy in Kapolei starting this fall. By the time the first freshmen are juniors in fall 2009, UH-West Oahu officials hope to be able to move into a newly built $135 million campus near the Kapolei Golf Course. Currently, UH-West Oahu offers only two years of junior- and senior-level classes for its 858 students in what Chancellor Gene Awakuni describes as "Pearl City rustic" wooden portables. At a college and career fair at Leeward Community College last week, the UH-West Oahu booth was tucked away in a corner, much like the school's current location on the far side of the Leeward campus. 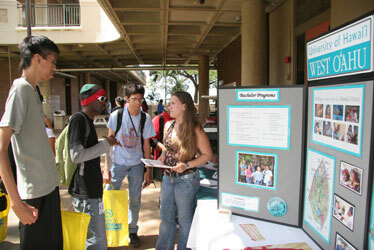 Most people at the career fair were students from nearby high schools -- the target market for UH-West Oahu. Julia Dela Sierra, a UH-West Oahu student who was staffing the booth, told prospective students, "If you apply by June 1, you don't have to pay the $50 application fee." 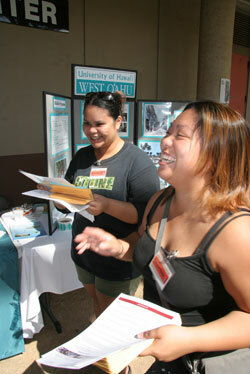 Chrisle Calpo, left, and Gretchen Domingo talk to Lynn Hodgson, UH-West Oahu natural science professor, at the UH-West Oahu booth at Leeward Community College's Career Fair. Kapolei High School seniors Ken House and Charles Macaraeg said going to classes in the evening in Kapolei might enable them to get part-time jobs during the day, and they liked the idea of being the first freshmen -- and potentially the first four-year graduates -- of UH-West Oahu. On the other hand, Jason Ho, a student at Pearl City High School, said he is more likely to go to Leeward Community College because it's closer to his home. Awakuni said the university has received about 50 applications so far, with more "trickling in." The deadline is Aug. 1. "We started late," he said, noting that the Board of Regents approved the decision to go to a four-year college in November, and because of the holidays, marketing materials were not ready until mid-January. Awakuni believes the school will start with 50 to 100 students. The plan approved by the regents is to offer about eight classes each night, from 5:30 to 9:45 p.m. Monday through Thursday. The classes will cover basic freshman topics like expository writing, college algebra and world civilizations. Classes in women's studies, Polynesian traditional arts and Hawaii environmental science also would be offered. Julia Dela Sierra, right, of UH-West Oahu talks with a group from Pearl City High School -- senior Joshua Ho, faculty member Rob Maoga and freshman Taylor Stowell -- at the Leeward Community College Career Fair. The total cost of adding lower-division classes at UH-West Oahu was estimated at about $952,000 in the coming academic year and $1.4 million in 2008-2009. The program will run a deficit in the first year but should generate a surplus in the second year, Awakuni said. Much of the cost is projected to be covered by tuition. The other major cost is salaries. The university may hire up to five people, if needed, to support the new campus, Awakuni said. But he said current faculty will teach the new freshman and sophomore classes. UH-West Oahu is also spending about $75,000 -- mostly on television and radio ads -- to get the word out that they are opening in Kapolei this fall. But at the college and career fair, some students were not even aware of UH-West Oahu. "What's this place?" one prospective college student asked Dela Sierra. "This is UH-West Oahu," she replied. "Isn't that where we are now?" he asked. "No, this is Leeward," she said. "Umm, OK, maybe we'll come back," the potential student said as he shuffled off toward a 20-foot-tall inflatable U.S. Marine at a recruiting booth across the courtyard.